The leader of The Movement of New Forces came to the building of the PGO but showed up before the investigator. 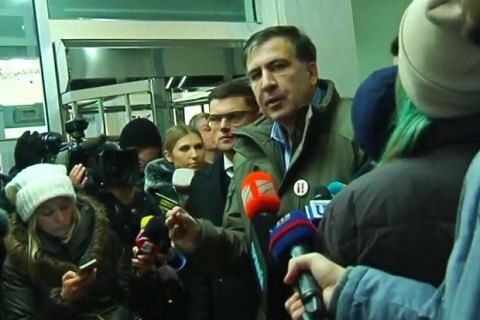 Former president of Georgia, leader of the political party The Movement of New Forces Mikheil Saakashvili came for questioning to the Prosecutor-General's Office in Kyiv on Monday, 18 December. Near the building entrance he told reporters that he has filed a statement to the National Anti-Corruption Bureau against the representatives of the Security Service of Ukraine (SBU) and the Prosecutor-General's Office. "I applied to the NABU about this criminal group that seized power in Ukraine, including people from the SBU, the PGO and other authorities. In the end, Ukraine will investigate this case rather than my [alleged] collusion with the FSB," Saakashvili said. He also commented on the Sunday events near the October Palace in Kyiv and said it was a provocation by law enforcers. Saakashvili refused to be questioned by the Prosecutor-General's Office and stated that his criminal case must be given over to the SBU. "When, in accordance with the law, this case is given over to the SBU, I will come back and testify," he said as quoted by Interfax-Ukraine. In a comment, the PGO accused Saakashvili of obstructing the investigation. In the course of a protest rally of The Movement of New Forces on Sunday, Saakashvili said he wanted to set the headquarters create of the opposition's coordination council in the October Palace in Kyiv's centre not to be chased by police in the tent camp. When the protesters approached the building, they were met by the National Guard. In the skirmishes that ensued the attackers used fire extinguishers and stones. The police used tear gas to prevent the seizure of the venue which at that time hosted a concert by Glenn Miller's Orchestra. Police said 32 law enforcers have been injured in the clashes.